Andrew Rudd, New York City. Much of urban history has emphasized density and centrality in city form. Though some environmentalists question the sustainability of such intensive land use, recent studies have shown that urban density correlates positively with resource efficiency and reduced emissions. At the same time, innovations in transport technology have historically allowed cities to extend their spatial edges. This tendency towards urban sprawl is accelerating worldwide. Despite some possibilities for decentralized self-sufficiency, many urbanists cite the high per capita footprint of extensive settlement patterns. In the late 20th century more hybrid forms appeared. Many cities now exhibit both intensiveness and extensiveness in crowded slums and dispersed peripheral areas, respectively. But a ‘reverse hybrid’ may be possible. Landscape urbanism, which emphasizes surface as a structuring element, may introduce innovative ways of reducing the footprint of more extensive settlement patterns. The world’s earliest cities formed more than 9,000 years ago on the Anatolian Plateau, in modern-day Turkey. 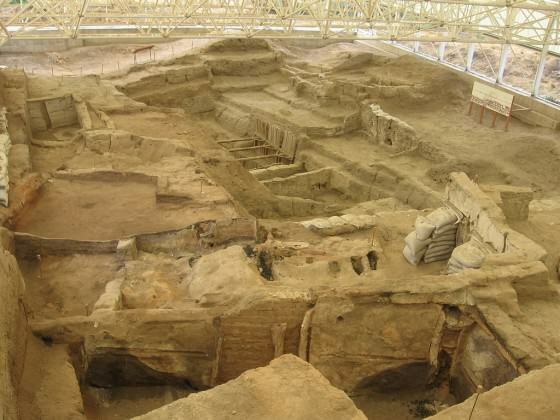 Of these, Çatalhöyük is the oldest yet discovered. Most likely it arose as the centre of a regional obsidian trade. Dwellings were narrow and deep, separated by shared party walls, and accessed through holes in their roofs. Roads traversed the roofs of the buildings. Earth’s earliest urbanites effectively lived halfway underground. Though it probably had no more than 10,000 permanent residents at its peak, this would have equated to 700 inhabitants per hectare. Such a density would have required a degree of restrictions over the hunter-gatherer lifestyle. And it clearly would have required the drawing of resources from a much wider area. But from the start agglomeration must have provided clear advantages. If not, the city as a form of human settlement—despite the extreme variations in its form since then—would never have endured until now. Not only may it have preceded agriculture—Çatalhöyük’s fossil record predates that of the earliest agriculture—but it may actually also have helped precipitate the agricultural revolution. Particularly in a pre-digital era innovation would scarcely have been possible without so many people in a concentrated space. This points to the city is a fundamentally qualitative rather than quantitative phenomenon. Its most enduring and essential qualities are permanent human agglomeration and the necessary sharing that stems from that. The land use intensity that cities represent has always possessed particular sustainability advantages. Denser cities mean more people accommodated on less land, and less per capita built-up (urban) land cover. (A recent adage has put it as ’50 per cent of the population on 2 per cent of its land area’.) This in turn allows greater areas of green space and natural habitat to be preserved intact. Naysayers have countered with claims that this 2 per cent of the earth’s land area is responsible for a severely disproportionate resource footprint, with estimates of energy consumption and greenhouse gas emissions at much more than 50 per cent of the global total. Leaving aside the complications of production, distribution and consumption, the average urbanite produces significantly fewer greenhouse gas emissions than the average non-city dweller in the same country. Wealthy countries—and wealthy populations in all countries—show that the culprit lies in unsustainable patterns of consumption and production rather than cities per se. All things equal, the denser a city the lesser its environmental footprint. Of course one size does not fit all. UN-Habitat is currently testing the range of 150-450 inhabitants per hectare in a variety of contexts. Optimal density is highly contingent on factors such as amount of green space per person, availability of mass transit, and cultural perceptions of crowding. An alternative viewpoint holds that excessive intensity (of human activity, of land use, of resource consumption and emissions) forfeits any of the sustainability factor that urban density might otherwise offer. It is true that the deep impact of dense cities may be detrimental to ecosystems’ restorative and regenerating capacities. Such intensity may also degrade much of the ecological character within the densest parts of cities’ footprints. Others may see this as an acceptable trade-off for the ability to preserve intact larger functional green areas in the periphery. All the same, the counterstrategy of dispersal has been steadily accelerating in its prevalence and sheer scope. Since the first permanent human settlements each new innovation in transport technology has extended the possibilities for living further and further from the old urban cores. Steam ships, trains, streetcars, automobiles, airplanes have all expanded cities’ frontiers. The latest tendency toward exurban sprawl is nothing new, though the postfordist restructuring of the late 20th century accelerated things to the point where it became difficult to discern where cities began and where they ended. Architect Cedric Price conceptualized the history of the city as an egg: in ancient times it was boiled and encapsulated within a hard shell; in the Industrial era it was fried, yellow and white still discernable, but more disperse; in the modern era it was scrambled, without clear distinctions or limits. In the early 20th century in the United States Frank Lloyd Wright advocated for settlements at much lower densities than the city of his day, which streetcars had extended but which still retained a discernable edge and remained relatively compact. But the automobile pushed the limits beyond cities’ historical recognition. 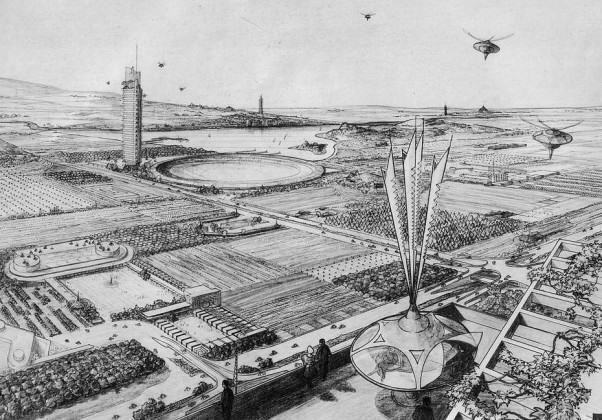 Wright’s Broadacre City model interspersed infrastructure with nature and spread the city much more extensively across the landscape. Extensive urban landscapes may bring some sustainability benefits such as decentralized power generation—ideal for certain renewable energy sources such as solar and wind—that can prevent the extreme energy inefficiency of distribution over a highly centralized infrastructure. They may also afford sufficient land for self-sufficient urban food production. However, Wright’s work—along with that of Le Corbusier—had the effect of fueling the largely unsustainable, fuel consumption-heavy, pro-private automobile frenzy that first took hold of the Post-World War II United States and has since spread as a growth dynamic and spatial reality in most areas of the world. (The American suburb in which I grew up weighs in at fewer than 20 inhabitants per hectare on average.) Sprawl is not only a result of the private automobile and its inherently extensive infrastructure. But the consequences—and the relatively weak, unregulated peripheries that they open up—are that sprawl is increasing in nearly every city-region in the world. And it shows few signs of stopping, particularly in city-regions in the developing world. In my last piece for The Nature of Cities I mentioned two meta-studies on global urban land cover that showed precisely this phenomenon. Much of this periurban sprawl may derive from an increasingly globalized economy driven by multinational corporations seeking to maximize profits in countries where labour and environmental protections are weakest. This also holds true at the city-region scale: production and distribution centres are now often strategically located away from dense cores and their relatively strict land-use regulations. It is these ‘no-man’s-lands’ that are most vulnerable to unrestricted and unsustainable development patterns. Even within the same metropolitan areas this can produce highly polarized urban landscapes. Postmodern geographer Edward Soja writes of ‘metropolarities’ and the ways that class and race divisions are increasingly represented within the geographies of contiguous areas of a single metropolitan area. Nairobi, which I will soon leave, is a city of such extremes. A thriving informal economy overlays an essentially independent, conspicuous mall-based one. Throngs of pedestrians precariously share car-choked highways with the other economy’s more insulated residents. And those same highways press outward to speculative low- and medium-density suburbs at the city’s fringe, following the global trend, at the same time as slums surrounding the core remain as congested and segregated as ever. In that sense Nairobi, like many other cities in the developing world, exhibits both intensive and extensive urban dynamics. My neighbourhood in Nairobi has a population density of approximately 5 inhabitants per hectare. By contrast, Nairobi’s dense Kibera slum accommodates more than 1,000 inhabitants per hectare. The first time I visited Kibera I was struck by the thinness of it all. Tightly-packed dwellings of corrugated iron were strung together with threadlike, jerry-rigged electrical lines, creating a filigree between the footpaths and the sky. Similarly jua kali television antennae shot above the rooftops on thin metal poles, bending and waving in the breeze like young, willowy tree shoots. Below, on the footpaths, was a carpet of plastic bags, banana peels and other castaway items, gradually being compressed under the constant foot traffic. In Kenya many rural-urban migrants continue to identify with the village and region from which they came, and do not necessarily see themselves as Nairobians. 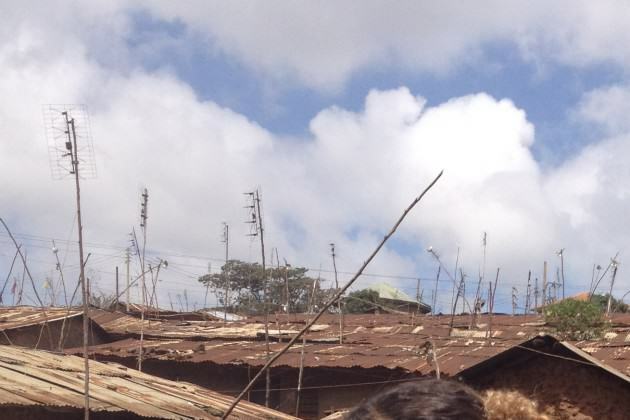 Many Kibera dwellers probably imagine their stay is temporary. Conceptually they may live lightly, never putting down roots, a quick in and out each day, imagining relocating to a more permanent life elsewhere once enough money can be saved. Not only does temporary residence often ends up lasting much longer than intended, but living so lightly in a place also has longer-term sustainability consequences. And it embodies how systemic urban failure occurs before agglomeration advantages can ever be realized. They don’t put down deep roots, but the consequences are there in the soil. A friend of mine works for an NGO that constructed a public space and concomitant water infrastructure in Kibera. The project also featured an urban agriculture component that consists almost entirely of sack gardening. My friend explained that this was because the gradually compressing layer of non-biodegradable plastic bags was sterilizing the soil to the extent that virtually no worms could be found. As a result, the soil could barely support life. With the global rural-urban exodus showing few signs of stopping and cities expected to house 60 per cent of the world’s population by 2030—not to mention increasingly unsustainable food miles—cities are increasingly going to have to feed themselves. Not despite their density, but because of their density. In part this demands a return to the original hybrid urban landscape. But before then a more symbiotic urban nature must be found. The sparse city is not necessarily the terminal condition. Density is not dead. Many sprawling, low-density cities were built and continue to operate based on the presumption of indefinitely cheap energy (i.e. for long commutes and distribution via private automobile or truck and for heating large, stand-alone, single-use buildings). Very likely this cannot last. Moreover, despite technology that allows remote communication, face-to-face contact is more important than ever. Perhaps because it is rarer, place matters more than ever. The command centres of the global economy—London, New York and Tokyo—remain competitive because of their density and the interactions and exchanges of ideas and innovation that that density encourages. At the same time, some interesting hybrids have arisen. Landscape urbanists suggest that the increasing horizontality of the city requires a new discourse that acknowledges surface as the new structuring element of urbanization. In a way this constitutes a hybrid intensive-extensive model. We are indeed spreading. However, it may not be so thin as in the past. Stan Allen has referred to this urban landscape as a thick mat. This effectively represents a new three-dimensional way of looking at surface, and at a conflation of urban and natural. Perhaps we are not spreading ever more lightly across the surface as much as we are beginning to embed ourselves in the surface. But this increasing focus on surface need not forsake the age-old advantages of agglomeration. 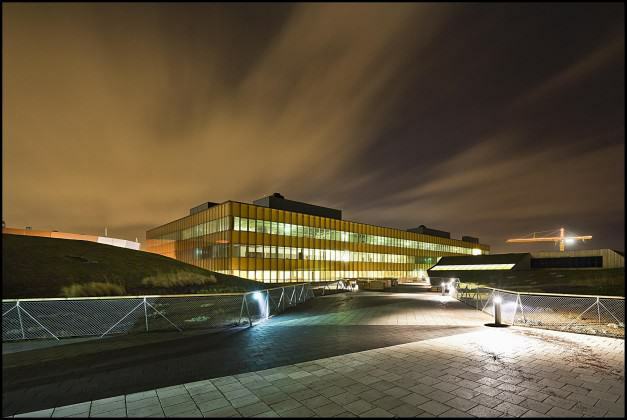 The increasing prevalence of phenomena like green roofs suggest that both may be possible. In this sense do green roofs signify going back to the beginning? Are they a new kind of high-tech Çatalhöyük whereby, having rediscovered the advantages of agglomeration, we are again taking to inhabiting the world beneath the ground plane? By recreating the ground plane above, is homo urbanus simultaneously becoming more of the earth? 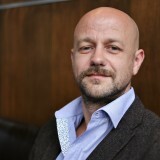 Andrew Rudd is the Urban Environment Officer for UN-Habitat’s Urban Planning & Design Branch in New York, where he leads substantive advocacy for the urban dimension of the 2030 Agenda for Sustainable Development (including the SDGs). A very thoughtful piece on an important issue with difficult trade-offs.